Wicked Tales: Dark Red is a 5 reel, 25 payline slot developed by Microgaming with a horrifying twist. Red is no longer the sweet little girl she used to be. Watch Red Riding Hood come to life in this game and re-live your childhood storybook tales in our online play slots. In the dark and bewildering woods lies stories yet to be told. Stories about people going missing, wolves scarily howling through the night and a mysterious woman causing mischief. There are lots of thrilling features within Wicked Tales: Dark Red including wilds, scatters, a forest of fortunes pick bonus and a free spins feature. With every spin, you have the chance to win a fairytale-like sum of money (up to 5, 000x your stake). To start playing, deposit £10 on slots games right away! Wicked Tales: Dark Red is based on the story of Little Red Riding Hood with a wicked twist. You'll explore the forest and complete challenges and if you're lucky and escape the wolves, you'll make it to the other side. Behind the reels, you'll see the classic Little Red Riding Hood scene with tall woodland trees, mossy meadows and Grandma's house in the background. The symbols include card suit symbols, a glowing full moon, a scary wolf, a candle and letter, Dark Red and the Wicked Tales: Dark Red logo. There's so much to learn from this game's details. Discover why it's among the top-rated online slots in the UK. Wandering Reels - As you may have already noticed, the reels are set out differently to most slots and this is because of the wandering reels feature. Wandering reels are 3 reels that spin at a time. The larger blocks are a great addition as this means you can get larger versions of the symbols to create bigger wins. 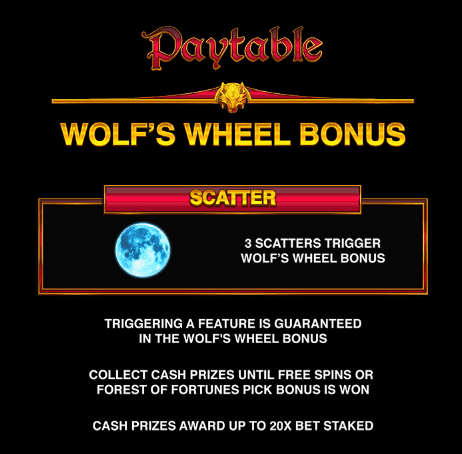 Wolf's Wheel Bonus - Landing 3 full moon scatters will activate the wolf's wheel bonus. Spin the wheel to reveal a cash prize worth up to a multiplier of 20x. Forest of Fortunes Pick Bonus - Landing on the treasure chest will unlock the forest of fortunes pick bonus. It's the perfect chance to pick up even more fantastic prizes. With every prize that is won, the multiplier will increase by 1x. Once you get to 10 cash prizes, the forest of fortunes pick bonus round will end. Respective Free Spins Feature - Landing on a high paying symbol will unlock the respective free spins feature. If you land on Dark Red for example, all symbols will be replaced by her character and this will inevitably increase your chances of gaining a winning combination. If you love fairytales, but also enjoy a good horror then you will adore Wicked Tales: Dark Red. It's a fantastic slot that mixes well with evil. The graphics go above and beyond and are incredible to look at whilst you play. There are lots of free spins on offer and also some mega multiplier rewards - a multiplier of 5000x to be exact! How magical. 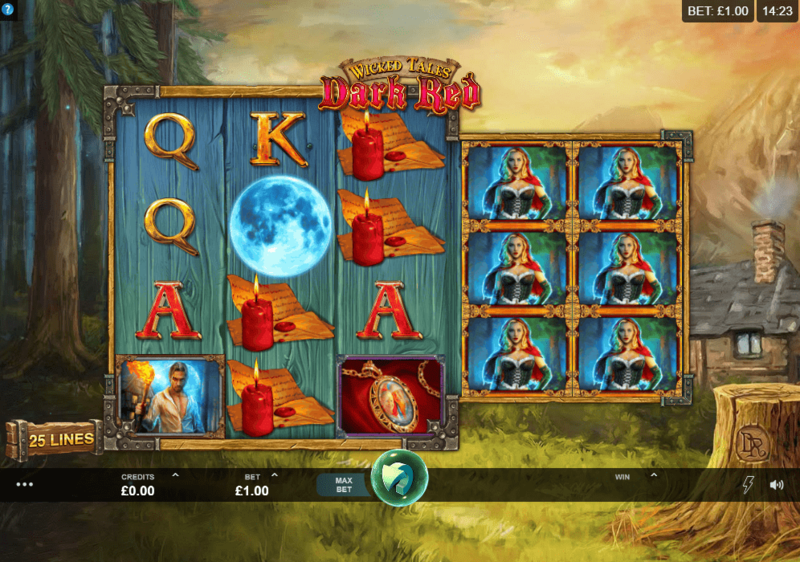 If you are enjoying this mystical, fairytale slot, you would also like our Siren's Kingdom slot.